Cheri sent us this sweet photo of her decal that we did as a custom design! Is anyone else jealous of her make-up table setup? Adding a decal to an interior door is a great way to personalize your space. We have lots of little decals that will work on a door. Or, you can use our Design Center to make your own custom creation! Does that sound overwhelming? No problem, our Design Team is on standby to help you out. Cheri has been sent a $50 gift card to use in our shop! Still lots of time left to send us your photos and enter for December's drawing! 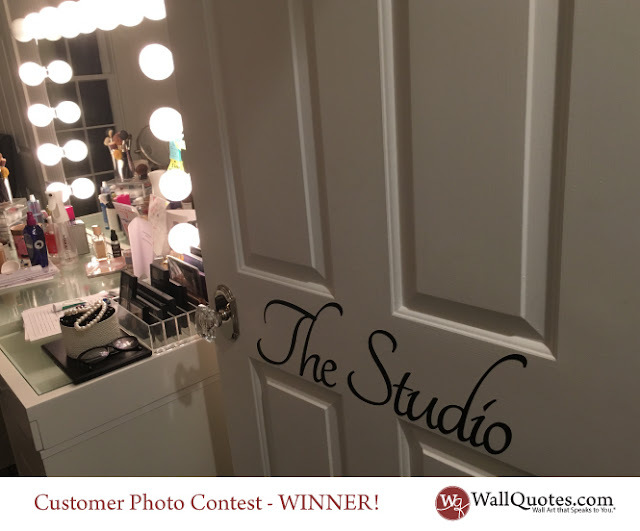 Send in those photos to info@wallquotes.com. Or, tag us @wallquotes on Instagram or @belvederedesigns on Facebook.